About a thousand natural sacred caves are scattered throughout the Holy Dzogchen Area; today hundreds of them are habitable. These caves can be found in the snow mountains, rock mountains, forest mountains, and grass mountains. They vary in elevation from 2,700 to 7,000 meters above sea level. The area has magnificent views, dotted with hundreds of colorful lakes, impressive waterfalls, beautiful flowers and trees, and is home to many species of birds. Here many of the world's most highly accomplished practitioners went into retreat and achieved enlightenment. At Gangtro Gongma, the Snow Mountain's high lake cave, Dzogchen Pema Rigdzin, Paltrul Rinpoche, and Nyoshul Lungtok spent many years in retreat. Other practitioners achieved enlightenment here. 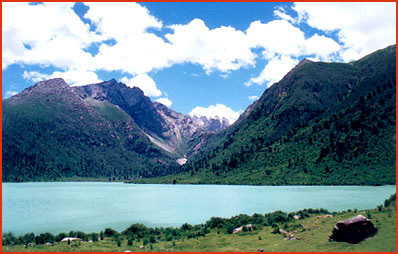 At Gangtro Barma, the Snow Mountain's middle lake cave, Padmasambhava lived for three years. He concealed many Dharma treasures in this area. Many practitioners have attained enlightenment here. Dzogchen Khenpo Choga Rinpoche has since rebuilt a statue of Padmasambhava in this cave. At Gangtro Okma, the Snow Mountain's low lake caves, Pema Kundrol Namgyal and others lived for many years. Many practitioners have achieved enlightenment here as well. 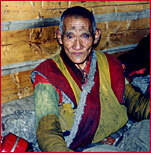 At Tamchen Gang, the rock caves, Namkha Tsewang Chokdrup lived his entire life. Khenpo Ngakwang Norbu and others achieved fruition here. 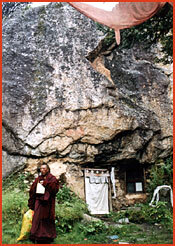 At the Ngakchungma grove caves, Mipham Rinpoche and others made extensive retreats and accomplished Dharma practice. In the Senge Druppuk caves, Shri Singha lived for many years and many subsequent practitioners reached high realization there. At the Shinje Druppuk upper cave, Dodrupchen Kunzang Zhenphen accomplished the Buddha Yamantaka yidam. Many masters who stayed here achieved very high Siddhis. At the Shinje Druppuk lower cave, Paltrul Rinpoche wrote many books, and Abu Lhagung and others stayed for many years to practice Dzogchen. At the Tsering Jong caves, Vimalamitra, as well as several other Dzogchen Masters such as Do Khyentse Yeshe Dorje and Kenchen Pema Losel, stayed in retreat for many years, deepening their realization. These days the great practitioner Lama Karma and others live here. From the Peme Tang caves, Guru Padmasambhava blessed the whole Dzogchen area as a mandala three times. Khenchen Pema Dorje and Khenpo Ngakchung, among others, continued Dharma activities here for many years. At the Three Charnel Ground caves, Chodnyen Padma Tsewang and others completed wrathful practices. At the Horse Mountain caves, Tulku Drime Rinpoche and many female practitioners reached accomplishment. 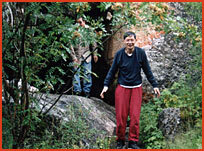 In Tadze Jong, the Right Canyon Caves, many humble Dzogchen yogis achieved Rainbow Body. At the Beyul Jong caves, many secret yogis achieved realization. Padmasambhava discovered a sacred, hidden Dakini city in the Galaxy Lake of Beyul Jong. At Shona Jong, the Left Canyon caves, many wrathful practitioners accomplished secret Vajrayana fearless actions. At the Gyalmo Drakkar White Rock caves, Padmasabhava gave teachings to the Dharma Protectors. Afterwards, many Chod practitioners achieved realization here. Later, Khenpo Thup Ngyen taught Dzogchen here for many years. Every day from these and many other caves, some unnamed, you can hear at least thirty different Dharma-summoning horns announcing practice all over the sacred Dzogchen valley. There have been numerous miraculous signs of many past Dzogchen masters throughout the Holy Dzogchen Area. 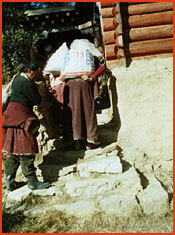 In 1959, most of the Dzogchen mountain caves were damaged. In 2000, our master, Dzogchen Khenpo Choga Rinpoche, gave US $46,000 to Rigdzin Tarchin Rinpoche, lifelong retreatant Lama Karma, and local leaders Tsultrim Gyaltso, Pema Chopel, Kaga, and Rikgho. These funds allowed for the repair of twenty-five caves and made it possible to support approximately twenty-five practitioners who wished to spend more than one month in a solitary cave retreat. Rinpoche would like to express his great love for this area. His fervent wish is to take care of these sacred caves and preserve the Holy Dzogchen Area's pristine environment. Because it is home to so many genuine Buddhist practitioners, it is the jewel of our world. Retreat practice is the fastest way to enlightenment. Anyone who truly wants to practice the Dharma and has the guidance of a Dharma master can now do solitary retreats in these holy mountain caves with the consent of Dzogchen Monastery. Many practitioners would like to do such retreats; however, it is difficult for them to stay in the caves because many are in need of repair, and retreatants are in need of outside support. We are now completely supporting more than 40 cave practitioners in the Dzogchen area. We would like to be able to serve 108 practitioners in solitary retreat. Sponsorship for one practitioner is US$25 per month. Your contributions to the Retreat Cave Project will be greatly appreciated. The retreatants will dedicate all your merit to your many lifetimes.